The black board in the New York Gold Room, September 24, 1869. The occasion for this week's Variations on a Theme is Black Friday, last Friday's shopping frenzy, in which stores cut prices (often to the items' lowest price points of the year) in order to get people to buy products. Incidentally, Black Friday reminds me most of the Steely Dan song of the same name, which refers to an event not all that unrelated to the current iteration of the term. The Dan's song concerns the Black Friday of 1869, when speculators James Fisk and Jay Gould attempted to corner the gold market. Fisk and Gould hatched a scheme to get close to the president (at that time, Ulysses S. Grant) so as to give other financiers the impression that they had inside knowledge of the government's actions. When they started buying gold at a low price, others took notice, and it sparked a rise in the gold market. Gould and Fisk were just waiting for the right time to unload the gold they bought cheap, but actions taken by Grant and the treasury secretary prevented the two financiers from cornering the market, which could have caused financial panic, as gold was the means of exchange in foreign trade. The Steely Dan song refers to the panic caused by financial fallout ("I'll stand down by the door/And catch the grey men when they dive from the fourteenth floor"), but more directly to the financier's escape. In my mind, Steely Dan's "Black Friday" is about how a financier isn't all that different from a bank robber or common criminal, even though they are accorded a different stature. Steely Dan's recordings are some of the most immaculate and notoriously expensive in pop music history, so whether or not the irony of the recording's extravagance is lost on the duo I'm not sure—I'd like to believe they're in on the joke. Basically, little's changed. Black Friday in both contexts refers to a small group of people taking advantage of the populace: on one hand, financiers taking advantage of financial markets; on the other, businesses marketing an event to take advantage of consumers. 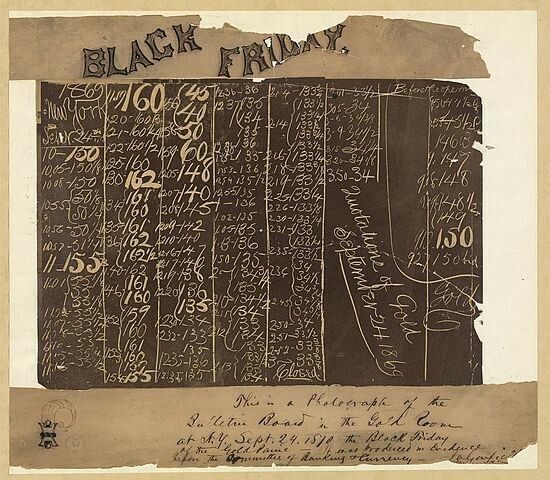 Encourage people to buy things and fleece them unawares is, a century-and-a-half later, the Black Friday motto. In light of that, break out your copies of Das Kapital and tune in all this week on the Bleader for Consumerism Week, in which Reader staff drop words about other people dropping money on the counter. In case you missed it, check out Turkey Week, last week's Variations on a Theme, wherein we wrote about duds, flops, and zeros. And check out a YouTube clip of Steely Dan's "Black Sunday" below.